Should I get a golf rangefinder with slope? Home / Rangefinder Guy General Posts / Should I get a golf rangefinder with slope? Rangefinder with slope is a common term you will see when checking out the rangefinder market. The majority of units out there are non-slope versions, but all of the big brands have plenty of options available for rangefinders with slope. The big question is, do you need (or want) slope on your next rangefinder? There are a couple different things that need to be thought about before we can help you answer this question. Do you play in golf tournaments? Do you post scores to the Golf Handicap & Information Network (GHIN)? Do you frequently play golf courses that have large elevation changes? In order for your rangefinder with slope to be legal for tournament play or GHIN posting it must not include slope, or you must be able to disable the slope function. If you use the slope function at any point during a round for tournament or that you post for your handicap you are breaking the rules of golf. How much does the slope matter anyways? Being a flatlander from Central Kansas, I barely know what a hill is. The only elevation changes on my home course are the tee boxes and greens raised a few yards above the fairways. The largest slope adjustment I’ve ever seen using a rangefinder with slope on the course is a few yards, not enough to make a difference in my game. In a situation like mine, slope barely comes into play, and I wouldn’t spend an extra dollar on the option. If you are from a region that has big elevation changes into fairways or greens it may be a different story. 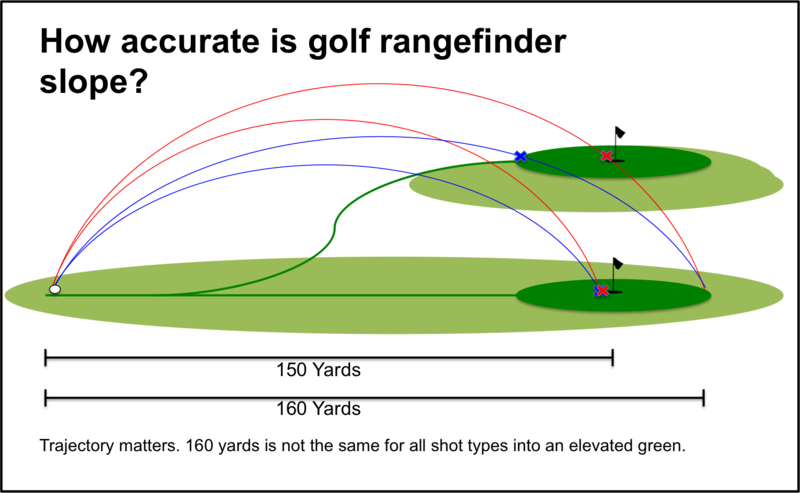 Is a golf rangefinder with slope accurate? You will hear some mixed opinions on exactly how accurate the slope-measurement is on golf rangefinders. I have pretty limited experience myself with these units, but I have used them enough to get a good feel for how they work. The slope adjustment is made based on the angle the rangefinder is held when getting a reading on the flag. It makes a calculation to find the slope-adjusted distance based on this angle. The biggest issue you’ll run into is that the slope-adjustment shouldn’t be the same for all ball flights. Here is an example. 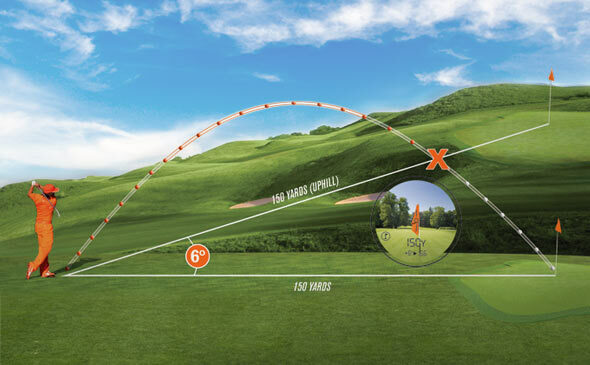 In this example, a rangefinder has made a slope adjustment for the raised green with the calculation that this should be a 160-yard shot. Both red & blue golfers hit exactly 160-yard shots into the elevated green, but the blue golfer came up short. This is a very extreme example, but it emphasizes the point that not all shot trajectories produce the same results when you start trying to account for elevation. With this being said, it doesn’t mean that the slope-adjustment can’t be accurate. It likely works out fairly closely for the majority of golfers. My thought is that you will have to tailor the slope-adjustment given to your own game. Make mental notes of whether you’re still leaving it short after clubbing up on up-hill shots, or going long when clubbing down at the down hill swings. The slope-adjustment will give you a leg up on someone without it, but everyone is still making some type of adjustment in their head about what club to use and how hard to swing. Should you buy a rangefinder with slope? This ultimately comes down to what your needs are. If you play tournaments or keep a handicap on GHIN, then you should avoid slope rangefinders unless they have the option to turn off the slope function. If you live in a region with lots of elevation change than it may be a nice feature to have. If you’re a flatlander, I wouldn’t bother. Only you can decide from there.